Name five random things that you feel impart a bit about you without describing you physically. It's Saturday so why not? Can you do it? Tag. You're it. I am a die hard Pantera fan. 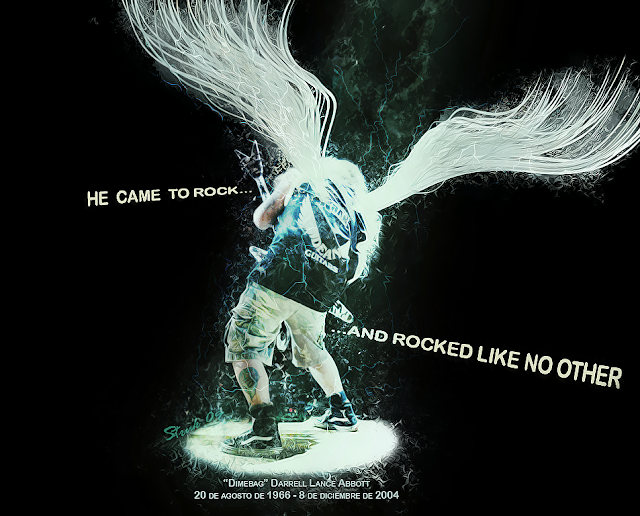 I still get weepy eyed when I think that Dime will never be shredding his guitar for any of us ever again. No song brings me to my knees like Cemetery Gates does. Phil Anselmo's vocals are just.... goosebump creating. It's so heartbreaking. These two just as a duo- were power. Pure metal power. The band? Groove Metal Geniuses. Unfortunately, I can't remember where I found this. If this is yours, please let me know so I can give your proper credit! Do any of you watch AMC's Mad Men? I haven't watched season six yet but the first four were amazing, season five was a bit different but not in a bad way. I will be catching up soon. I must admit I am a sucker for the fashion, the drinking, the sexuality, and watching the changing times. Fabulous.